Hispanic Heritage month begins on September 15. Check out these great webinars to learn more. US Census Bureau: Webinar. Hispanics by the Numbers. 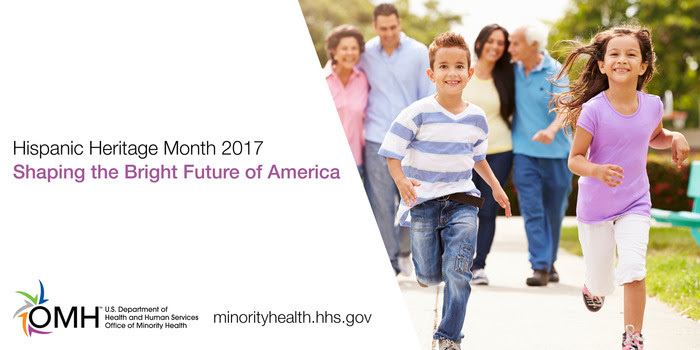 Learn how the Census Bureau collects, tabulates and publishes data on Hispanics in the United States. This webinar will cover numerous topics, including the history of the Hispanic population in the US, growth, top states and top percentage changes, as well as the top percentage of Hispanic ethnicities. October 5, 2017, 1:00 pm ET. Join. HHS/OMH, OMHRC: Webinar. Niños saludables: Addressing Childhood Obesity among Latinos. Join OMH, OMHRC, Unidos US and UT Health San Antonio as they highlight the prevalence data and explore the factors, such as culture, behavior, and environment, that have contributed to the increase of obesity in Latino children of all ages over the past 30 years. October 12, 2017, 2:00 pm ET. Register.